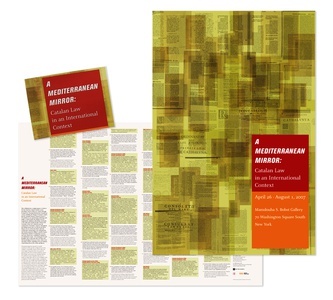 In addition to the A Mediterranean Mirror: Catalan Law in an International Context exhibit design commission, the firm was also asked by New York University to design its print campaign, exhibit brochure, invitations and poster. The exhibit’s 24 books, organized in chronological order, contain a simple purpose: to examine the laws that have shaped Catalan society and its struggle for independence, from Catalonia’s medieval society to the 20th century document established it as an autonomous region within Spain. The richness of these texts, thousands of pages that have shaped the law and liberty of Catalonia, are visually represented by the layers and layers of documents, metaphorically expressed as a “transparent sea” in numerous, unifying graphic treatments.